Make this lovely "Star Chain" quilt using our instructions and Studio 180 rulers. Instructions include help with fabric selection - an important element in this quilt. "Star Chain" is Yankee Pride's Fall 2016 Mystery Quilt pattern. This quilt is made with only three or four fabrics, putting a lot of emphasis on your fabric choice. Lucky for you, Judy's Mystery Quilt patterns include guidance on your fabric selections, so you can make a stunning quilt on your own! This quilt was made using several Studio 180 rulers, so if you have them, pull them out, dust them off, and get ready to use them here. They really improve speed and accuracy. 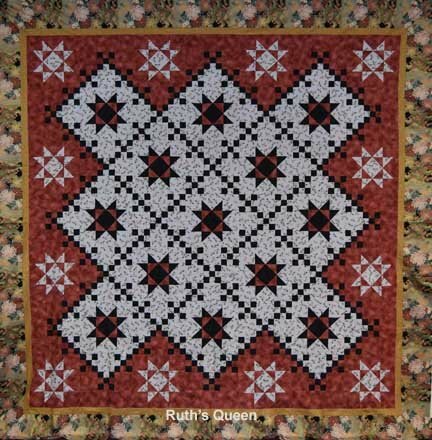 This Mystery Quilt can be made in three sizes: Wall, Throw, and Queen. Click here for yardage information and fabric selection help. And to see what our students made during this Mystery, check out our Fall 2016 Mystery Gallery.